I’m guilty like most automotive bloggers of covering the larger brands more than some of the small players in the market. One brand that doesn’t get a lot of play is Mitsubishi. Well I wanted to find out what a Mitsubishi was doing with their efforts in social media and to my surprise I came across an unique way for the brand’s Facebook page to include their dealers. Right now Mitsubishi is asking its fans to vote for the best dealer walkaround video. 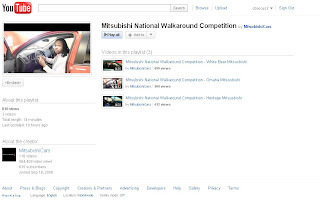 A walkaround video is where a dealer employee shows the features of a vehicle. The Facebook fans were asked to select from several dealer videos finalizing on three videos that are currently competing for a $2,500 prize to be awarded to the winning dealership. Some of the videos are typical walkaround experiences where the dealer representative simply details every single feature, one with background Minnesota polka music. There definitely is a format to what the dealers were supposed to do here as all the videos cover every feature inside and out and run about 4 minutes plus in length. Other videos are more entertaining with a bit more style, but still with substance. “Check out my curves and check out my lines,” sings one Omaha dealer who realizes there has to be some personality to keep people’s interest. Unfortunately like the more professional examples, none of the videos are that compelling and sitting through three 4 minute videos with basically the same exact content is a lot to ask, even from your fans. 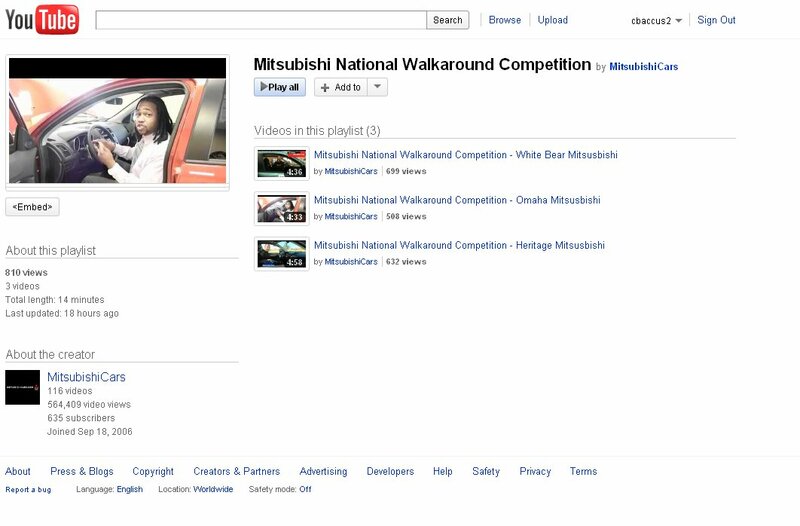 I do like the idea of getting dealers involved in a real way with the greater Mitsubishi Facebook fan base and it incorporates fans thoughts through voting which video is best. Unfortunately, the $2,500 prize money that is offered is offered to the winning dealer and not a supporting local charity which would’ve had a more compelling appeal to a national audience. Regardless, Mitsubishi is getting inventive with how to engage fans and finding ways to bring their dealers into the conversation. Sure this example isn’t going to turn into viral gold (total video views on the 3 final videos is at: 1,839 views), but it’s one way to extend goodwill between the OEM’s efforts in social and letting the dealer network reap some publicity too. Thanks ! I am really looking for a blog that offers a way on how to get dealers involved. Well, i am pretty sure it will worked. Nice idea.